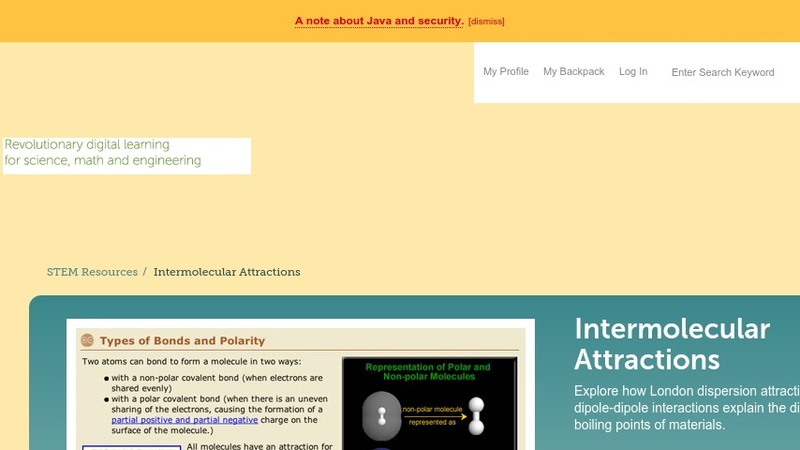 This concept-building module contains a variety of simulations for exploring factors that cause molecules to attract each other. It was developed to help secondary students understand both polar and non-polar covalent bonding. Users can manipulate models to see how the strength of attraction is affected by distance from one molecule to another, by heating the substance, and by mixing polar and non-polar substances. Part II of the activity is devoted to hydrogen bonds, and explores why water is one of the most important molecules for life's existence. This item is part of the Concord Consortium, a nonprofit research and development organization dedicated to transforming education through technology.